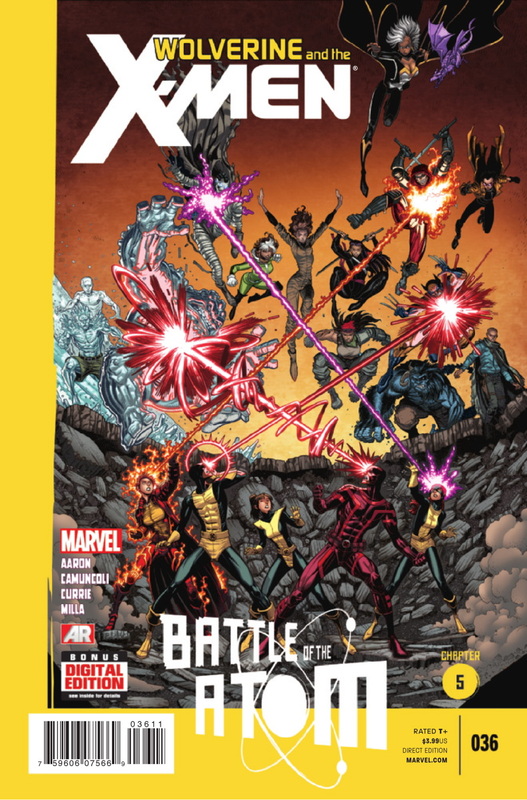 X-Men #5 is the first issue of Battle of the Atom that is not written by Brian Michael Bendis, it gives us some idea of how this crossover event is going to unfold over the various X-Titles, and Brian Wood does an excellent job of maintaining the pace and tone of the story. 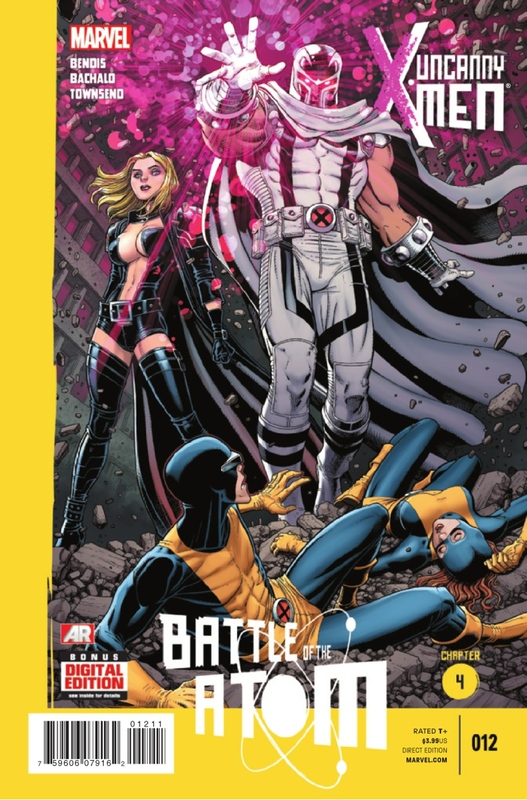 X-Men #5 picks up after the young Jean and Scott escaped in the Blackbird in All New X-Men #16, as both present and future generations of X-Men decide what to do next. We also learn that the adult Jean Grey can only manage without the Xorn helmet for a few minuets as her powers have grown so much. Brian Wood’s manages to include some fun scenes, including one where the past, present, and future versions of the Beast remind themselves about the test jet they built: as they collectively reminisce about designing it, after building it in the present, and then remembering it fondly – before their super sleek aircraft (The Dove) rises up through the floor into the hanger bay. 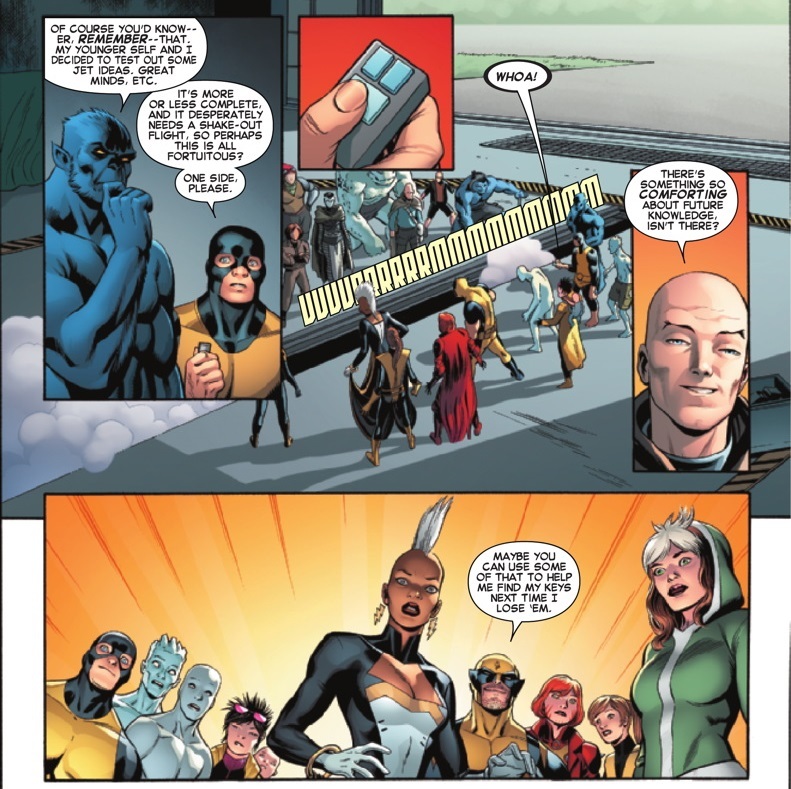 After Professor Xavier’s grandson takes a Cerebro Spike, a special pill to help them track Jean’s psychic trail, Storm decides that Kitty, Rachel, and Jubilee will stay behind at the school with the young Bobby and Hank, while she leaves with the others in the Dove to search for Jean and Scott. This leads to a great moment between Kitty and Rachel, as they talk about the Jean Grey from the future and their concerns about making the original X-Men to return to their own time against their wishes. 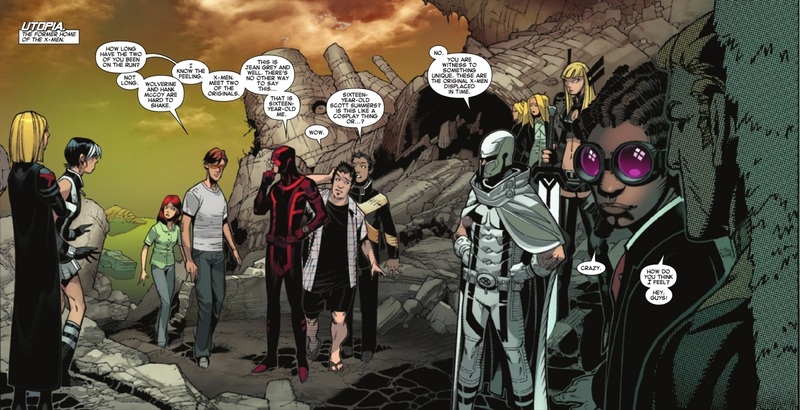 Kitty in particular has grown very close to them and Rachel believes that the young X-Men should be allowed to decide for themselves if they go back. The scenes where Jean and Scott are on the run are the real highlight of X-Men #5, especially when they steal some clothes from a washing line and get changed. It’s a wonderfully goofy and awkward moment for them, as it goes hilariously wrong. However, their conversation as they escape along the highway on the motorbike brings their relationship sharply into focus, when Scott admits he would do anything for her, but unfortunately Jean has no time to respond before the X-Men arrive in force to bring them in. 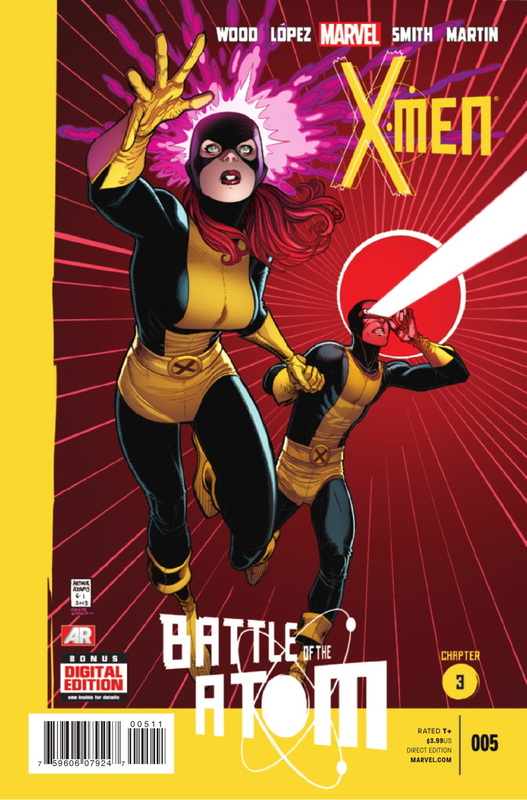 Overall this is a good issue, X-Men #5 provides Brian Wood’s with the some good character moments for his regular cast, particularly between Kitty and Rachel at the school, and a funny scene were Jubilee leaves Bobby and Hank to look after baby Shogo. 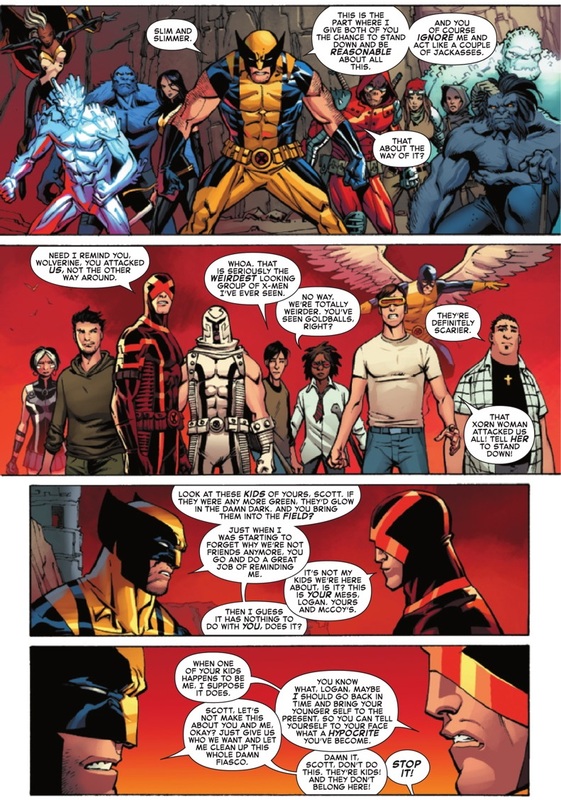 This issues tie-in does interrupt Wood’s main X-Men storyline in favour of the Battle of the Atom crossover, with the focus firmly placed on Jean and Scott’s developing relationship. The art by David Lopez, together with Cam Smith’s inks and Lara Martin’s colors, is also good, and I really like the cover by Arthur Adams. While it may not be indicative of Wood’s series as whole, X-Men #5 is still a good issue, and effectively slots into this big X-Men crossover event. Battle of the Atom is shaping up to be a really action packed story, with some great interaction between the characters, with tensions fraying between the teams as Scott and Jean make their way to Utopia. 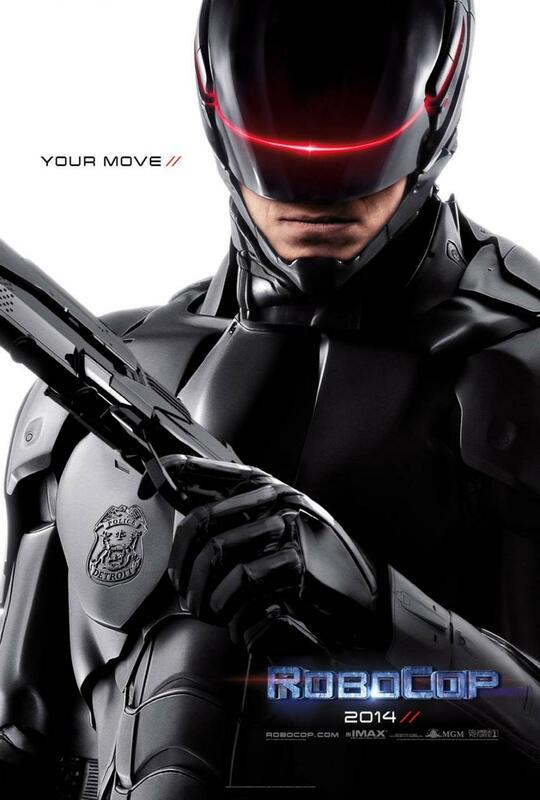 Columbia Pictures and MGM have released the first poster for Jose Padilha’s Robocop remake. 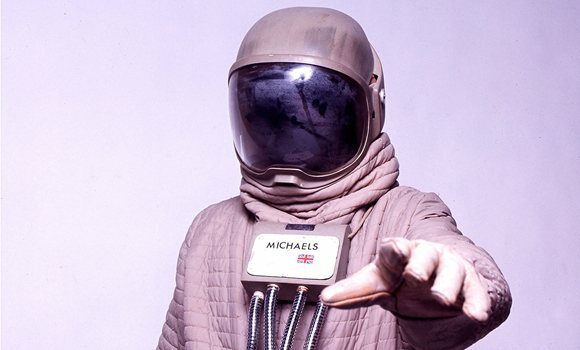 Robocop is set in the year is 2029 where multinational conglomerate OmniCorp is at the centre of robot technology. 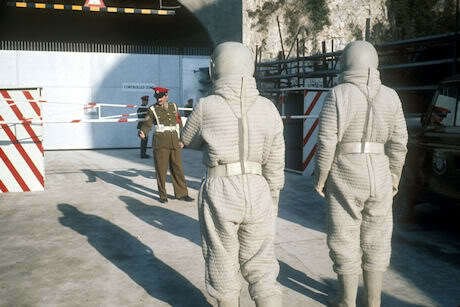 Their drones are winning American wars around the globe and now they want to bring this technology to the home front. The stakes have never been higher as The Walking Dead #114 sees Rick and his friends outgunned and at the mercy of Negan and the Saviors. After his attempt to kill Negan outside Alexandria failed, only Andrea, Michonne, and a handful of the remaining survivors remain to oppose the Saviors. When Carl tried to help by shooting a lump out of Negan’s trusty baseball bat, Lucille, the Saviors leader demanded the boy pay for it with his life. Tensions have been slowly building over the last few issues as Rick plotted with Ezekiel and the other hilltop communities to overthrow Negan’s reign of terror, now all the carefully developing plot strands begin to come together as Robert Kirkman sets in motion events that will lead Rick and the Saviors to All Out War. Last issues heart sopping moment, when it looked like Andrea had tumbled from the bell tower, gives way to a surprise attack spearheaded by Jesus, and backed up by Ezekiel and his pet tiger Shiva. It’s immensely satisfying to see Jesus fighting Negan one-on-one, as Ezekiel sets Shiva on the Saviors. Jesus quickly overpowers Negan, even holding a gun to his head at one point, before Negan manages to break free and escape with his men. Rick makes for the bell tower and is relived to find that it was the Savior who fell. 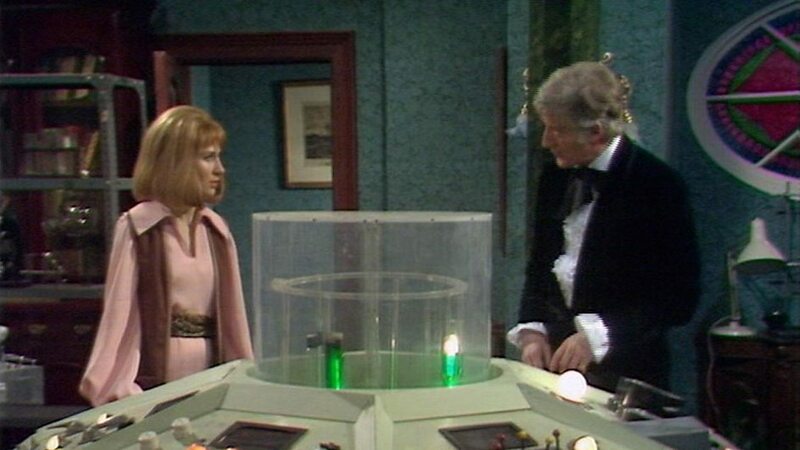 He rushes up to the top of the tower and finds Andrea. She managed to push her assailant to his death, but she was badly beaten in the process. After everyone gets patched up by Doctor Cloyd, Rick has to face some serious questions from both Andrea and Michonne, who fear that Rick’s attempt to kill Negan may have cost them their advantage in the upcoming battle against the Savoirs. 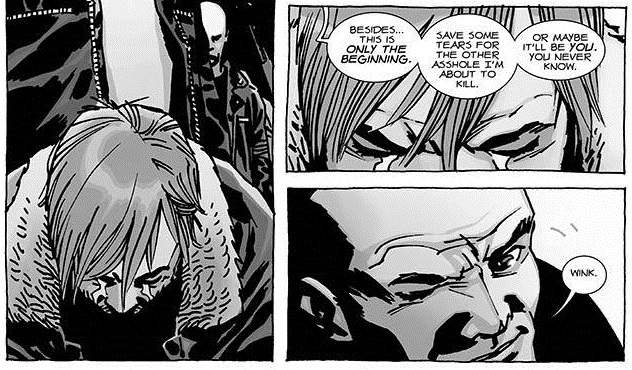 However, Rick doesn’t believe that Negan knows just how organized they really are. Negan is as vile and depraved as ever, taking delight in playing his captives against each other, while taking the opportunity to taunt Rick as the events of issue #100 hang like a bloodstained shroud over them all. 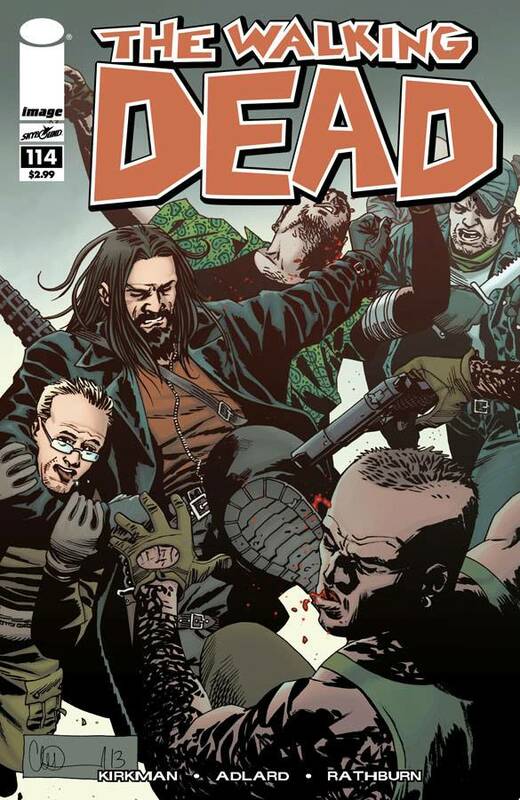 The second half of The Walking Dead #114 includes some excellent scenes as Rick leadership comes under the spotlight. I especially liked the moment where Rick takes the time to talk to Carl about how he kept his cool during the Saviors attack. Rick knows that the time has come for them to make their move against Negan, and a conversation with Jesus quickly makes him realise just how much his people look to him for courage and inspiration. In fact, Jesus plays a pivotal role in this issue, as the bearded loner gets to prove his worth by saving Rick and attacking Negan. But most importantly of all he makes Rick see just how vital his role is as leader of the survivors. Charlie Adlard’s art captures the raw strength of Jesus’ counterattack, which result with tense standoff as he holds Negan at gunpoint. We also get to see Shiva munch down on the Saviors, tearing across the page, claws rending flesh. These action packed scenes are well balanced by the quieter moments, where Adlard depicts every emotional beat as the characters react to recent developments. Carl’s bluntly delivered request, about how his father should deal with Negan, is a fine example of this, caught in his son’s cold unflinching gaze; Rick’s expression says it all. The Saviors return to their camp, where Negan declares that the time has come for them to go to war. As this is the last issue before the “All Out War” there is understandably a sense that pieces are being set in place by Kirkman for the next storyline. 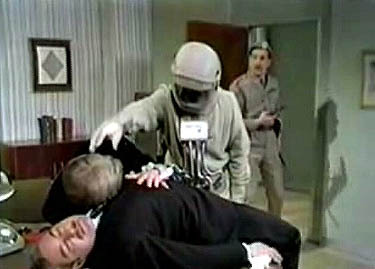 That doesn’t detract from the issue overall, although the pace slows noticeably after the initial burst of action. 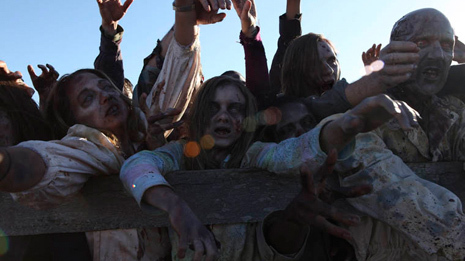 With the scene now set for All Out War, the Zombie apocalypse is about to get even more dangerous, as the hilltop communities fight it out in a desperate battle for survival. The Walking Dead #114 is another great issue by Kirkman and Adlard as the action intensifies and everyone readies themselves for All Out War. The eagerly awaited return of American Vampire is almost here. Set to appear in March 2014, writer Scott Snyder and artist Rafael Albuquerque’s award winning Vertigo series will finally emerge from hiatus to pick up the events following the series last story arc “The Blacklist”, as the story of Pearl, Calvin, and Skinner Sweet shifts from the 1950’s and into the world of the swinging 60’s. American Vampire began in 2010 featuring a story co-written by bestselling horror novelist Stephen King, since then Scott Snyder and Rafael Albuquerque have spent the last few years charting the story of the first American Vampire, wild west outlaw Skinner Sweet, and his Vampire progeny, the would-be movie star Pearl Jones. 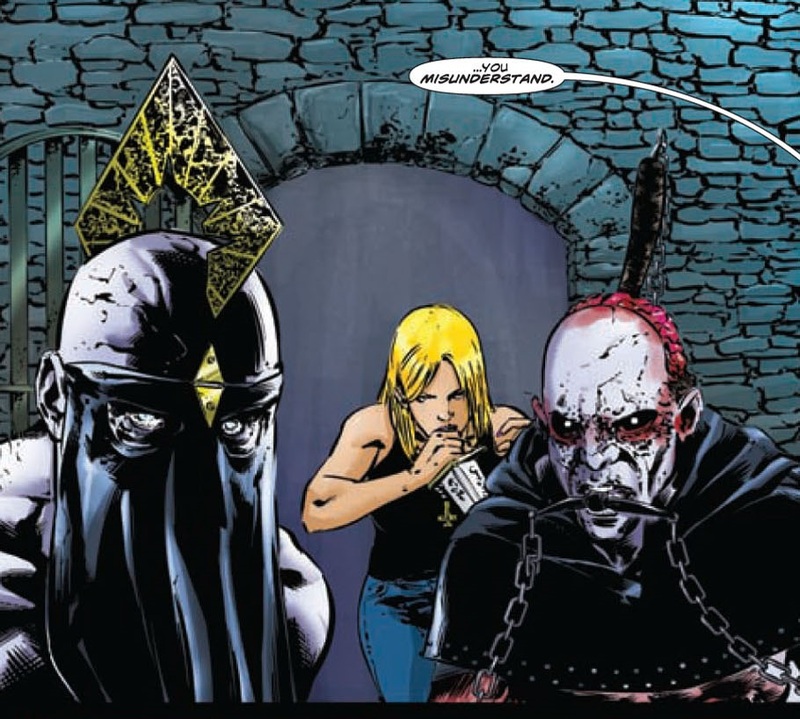 There series has won an Eisner and received critical acclaim from fans and critics alike, mixing its unique take on Vampire lore with a scientific and historical slant, banding its Vampires into different species, while Skinner and Pearl’s story begins to entwine with many of the biggest events of the 20trh century. While March 2014 may seem a long way off, this is the perfect time to catch up on all 5 volumes of the original series, as well as the recently published American Vampire Anthology featuring stories set in the world of American Vampire, with tales by some incredible talent including Gabriel Ba and Fabio Moon (DAYTRIPPER), Becky Cloonan (DMZ), Jeff Lemire (TRILLIUM) and Ray Fakes (CONSTANTINE) and many, many more. 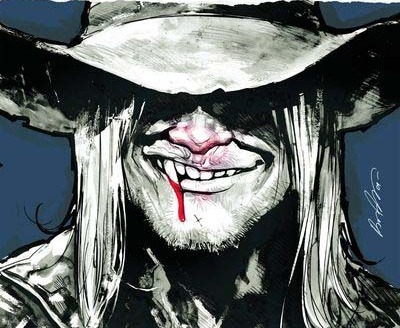 There is also the brilliant American Vampire: The Long Road to Hell, a one-shot special from earlier this year, featuring Travis-Kidd, by co-writers Snyder and Albuquerque, with art by Rafael Albuquerque. You might also like to check out The Wake, written by Scott Snyder with art by Sean Murphy (American Vampire: Survival of the Fittest), and Rafael Albuquerque will join Jeff Lemire from issue #24 of Animal Man. 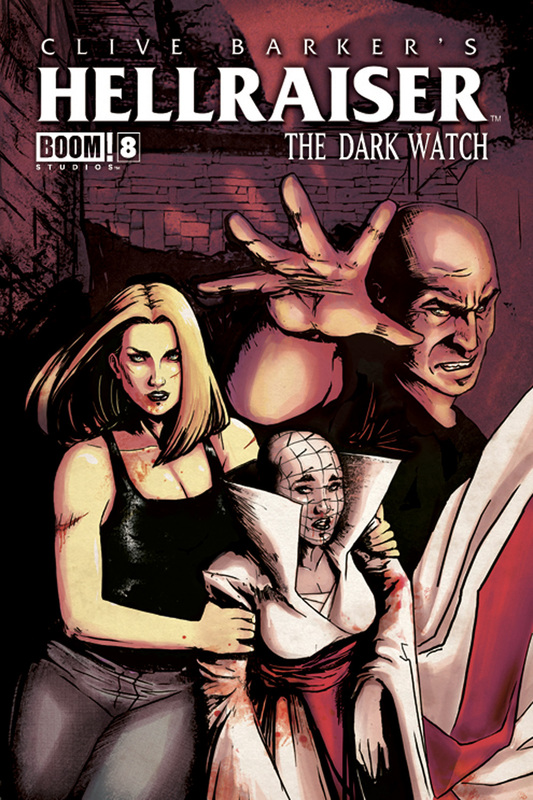 The first “Wake” trade is also scheduled for release soon, which will collect the first five issues of the series. So there is plenty to keep fans happy while we prepare for American Vampire to return.